The previous list did not help much. The Information Policy Ministry of Ukraine has drafted a new list of websites it wants to be blocked, it has told Interfax-Ukraine. The new list has 21 websites containing information banned for sharing by Ukrainian law. 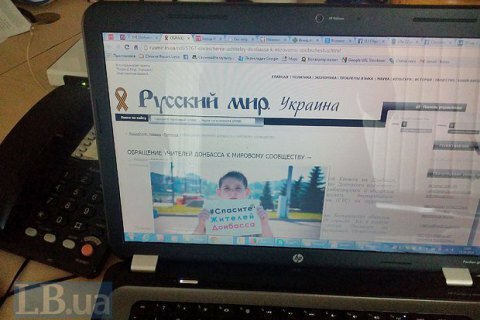 In particular there are dan-news.info, admin-gorlovka.ru, dnr24.su, gorlovka.today, golospravdy.com, s-narodom.ru, politnavigator.net, riafan.ru, dnr-hotline.ru, genocid.net, miaistok.su, dnr24.com, republic-tv.ru, ruskline.ru, dnipress.com, kianews24.ru, c-eho.info, crimea.ria.ru, c-inform.info, komtv.org and gazetacrimea.ru. Some of the reasons for banning include public calls for violent change or overthrow of the constitutional order, or for seizure of state power. The list drafted by the ministry's monitoring group was handed over to an expert council under the same ministry. "As the next step, if the expert council approves it and issues corresponding recommendations, the list will be handed over to law enforcers so that they could establish a fact of crime and react within their competence," the Information Policy Ministry said. The previous list of 20 websites which the Information Policy Ministry wanted banned was published on 19 June 2017. However, they were not banned after all.